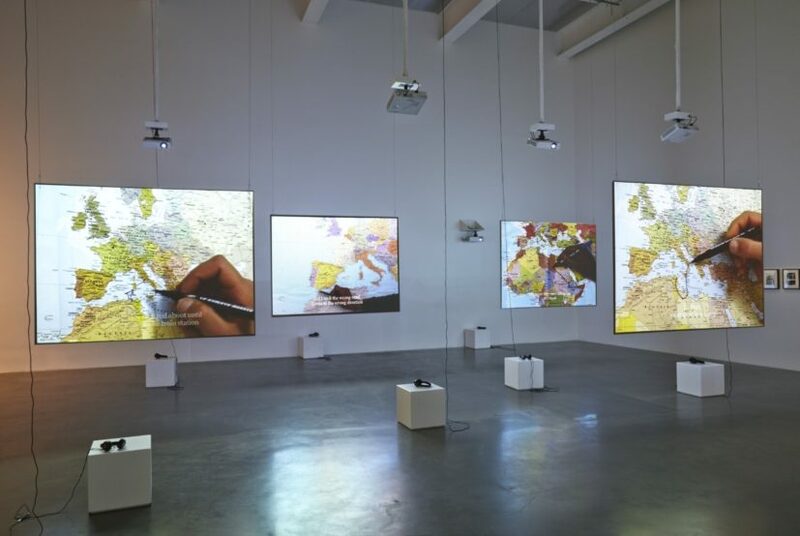 In the Mapping Journey Project (2008-2011), Bouchra Khalili (b. 1975, Casablanca) employs geographical maps as a means to reveal what generally remains hidden from our eyes in cartography: the clandestine and illegal journeys made by migrants. For this film project, the artist met a number of displaced individuals in transnational hubs such as Bari, Istanbul or Marseille. After a lengthy conversation she asked each of them to recount their complex and often challenging journeys while drawing their routes with a permanent marker on a map. 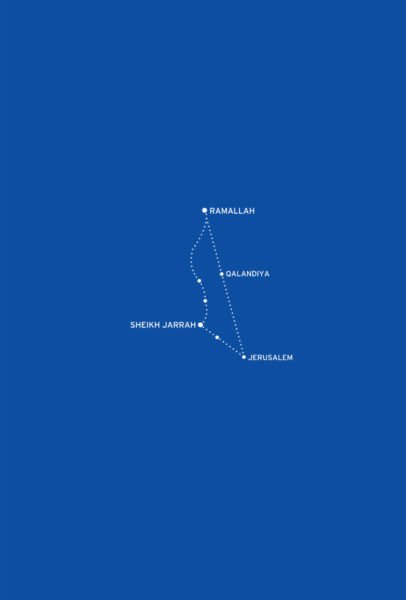 All head towards Europe bar one: Mapping Journey # 3 charts the lengthy trip of a Palestinian man travelling to East Jerusalem to see his girlfriend. The map he draws on shows the lines of conflict in the region, which since the film has been made have changed continuously. 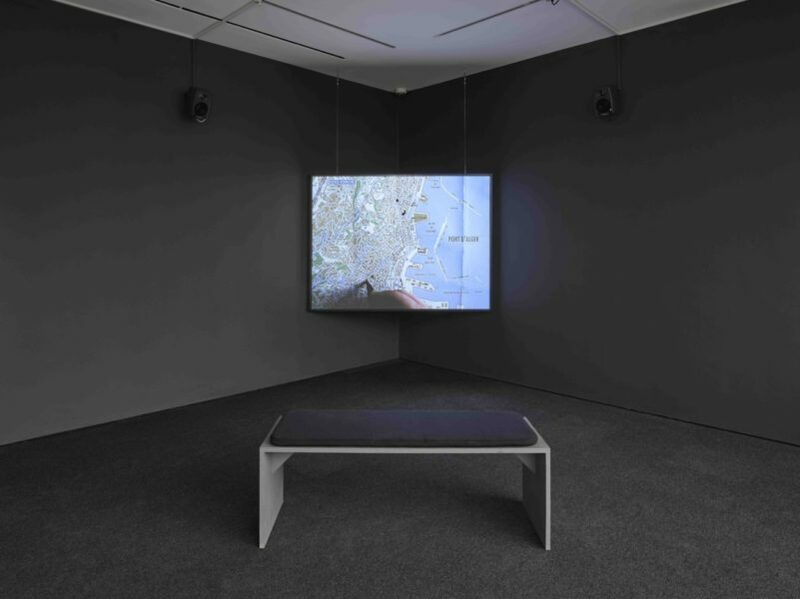 Visually simple, the eight videos of the Mapping Journey Project just feature the hand of the narrator, drawing his/her parcours onto the map’s surface. 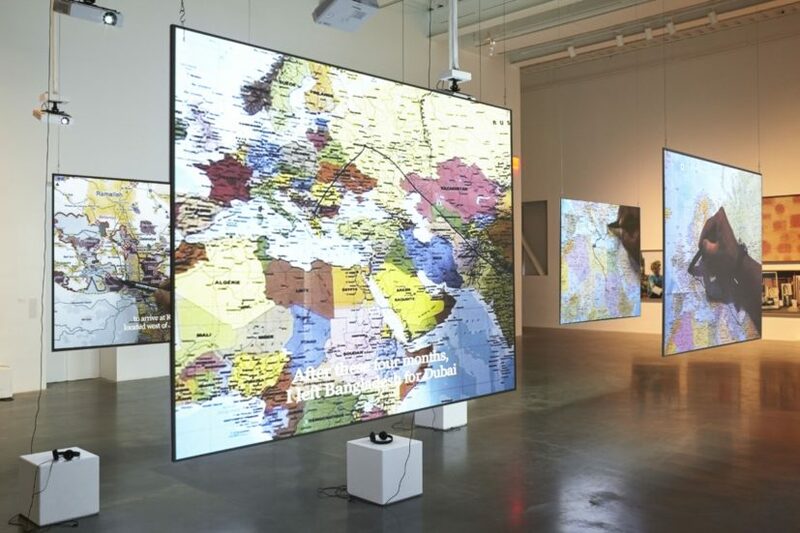 The ‘animated cartographies’, projected on the front and back of four large screens, are dotted throughout the space. This deliberate layout urges the visitor to navigate through the space, thereby getting a sense of the fragmented geography the migrants have experienced. The French-Moroccan artist gives these undocumented individuals a voice. By making them the main protagonists of her videos she challenges the stereotypical representation of migrants in the mainstream media. The Mapping Journey Project creates an alternative and a counter-geographical atlas of the world – one that speaks of displacement and exile, but also of resistance, strength, and determination. 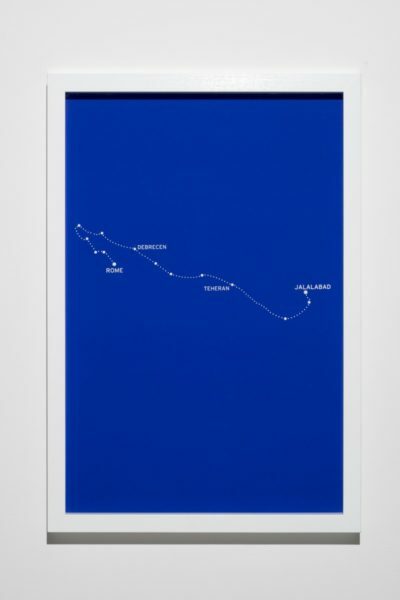 In the Constellation Series (2011) Khalili has translated the trajectories the migrants have drawn on the maps into silkscreen prints, seemingly displaying arrangements of stars. 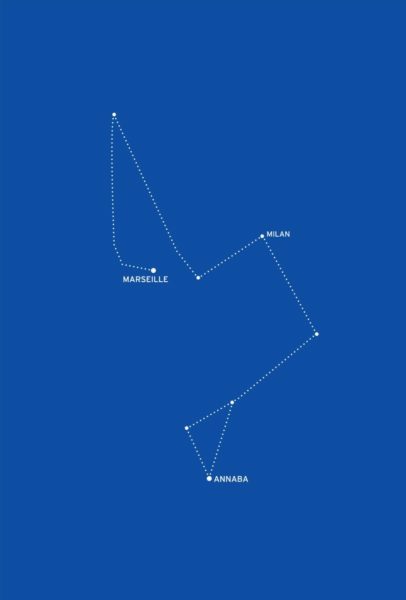 This poetic work is inspired by astronomic charts that sailors have used over centuries to locate themselves in a space without landmarks. Each print is erased of territorial boundaries – a heterotopic map – and in this borderless space each migrant route can be read as a singular constellation in time and space, as well as a continuous journey free from obstacles. Another work in the exhibition, called Foreign Office, addresses Algeria’s forgotten revolutionary history. From 1962 until 1972 Algiers was home to many anti-colonial and liberation movements from around the world, from the African National Congress to the Black Panther Party. A film features two young Algerians piecing together Algeria’s forgotten past through photographs of revolutionaries, quotes from different movement leaders and oral histories passed on sporadically by their parents’ generation. Accompanying photographs of abandoned interiors reveal the paradox between the colonial architecture of the buildings and their former use as ‘Foreign Offices’ by international independence movements. 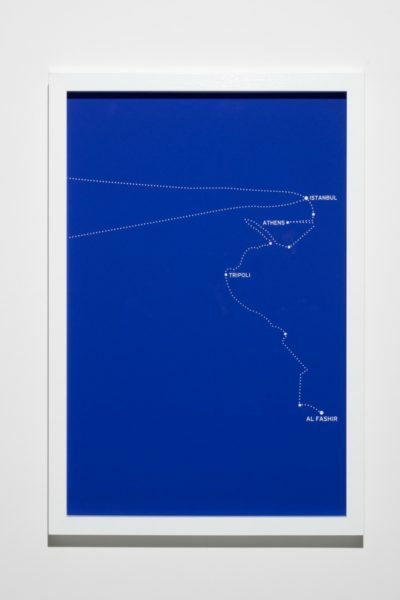 Khalili’s cartographic approach is again reflected in an abstract map, this time called Archipelago, which visualises the former headquarters of the revolutionary movements as a chain of islands across Algiers. 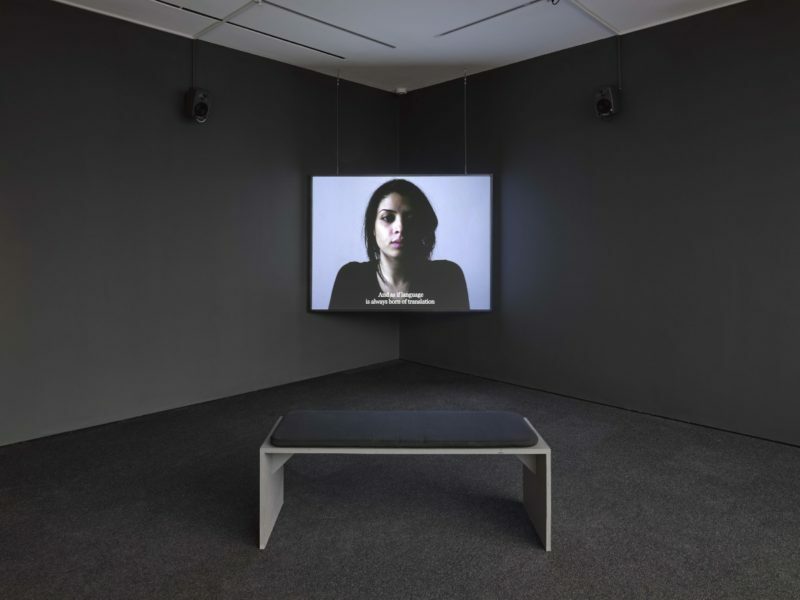 Overall, Bouchra Khalili’s practice powerfully undermines the grand narratives of history and the geographical and cultural barriers inherited from our colonial past. 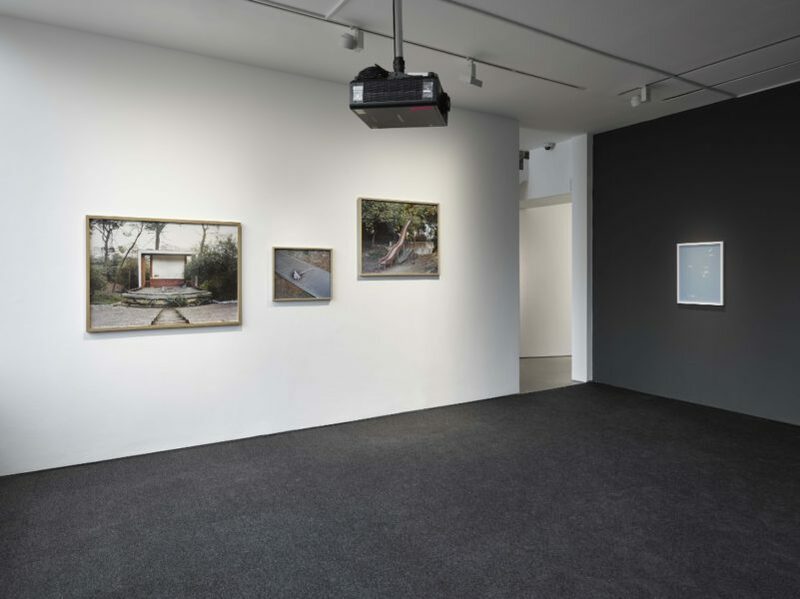 At the same time her work engages with current pressing issues on exile and displacement. Her presentation of ‘counter-geography’, and the power of oral history, can be understood as a means of reclaiming history and space from the perspective of subjects that are situated at the margins of the global order. Bouchra Khalili studied Film at Sorbonne Nouvelle and Visual Arts at the École Nationale Supérieure d’Arts de Paris-Clergy, France. She currently lives and works in Berlin, Germany and Oslo, Norway. Upcoming exhibitions include Living Labour at Wexner Centre for the Arts, OH, USA, The Restless Earth curated by Massimiliano Gioni at the Triennale, Milan and Documenta 14 (Athens, Greece and Kassel, Germany). Previous solo-exhibitions include The Mapping Journey Project, MoMA, New York, NY, USA, 2016 and Foreign Office, Palais de Tokyo, Paris, France, 2015.